If you plan to dismantle pallets on an ongoing basis, either occasionally or in a mass production environment, you will benefit from having the right tools for the job. There is a range of options for taking apart pallets, including pry bars, power hand tools, as well as machinery for high-volume recycling operations. These are reviewed below. If you are just going to dismantle a few pallets, this can be done without any special tools, which is discussed in this article. The pry bar is a commonly used tool for manually removing pallet boards. There are two main styles of pry bar designs. These styles include the duckbill and the double fork. The duckbill is well suited for prying the lead board from the edge of the pallet without breaking the wood during removal. The tool's jaw is placed over the board and then the handle is levered upward. The double fork pry bar is used to remove interior deck boards. Its effectiveness is predicated on the heel of the bar resting atop the stringer, and then through the application of leverage, the forks move up under the next board and pry it loose from the stringer. The accompanying picture for this article shows a combination bar that has a duckbill attachment at one end and a double fork at the other. Power tools can take much of the effort out of dismantling pallets. Two common approaches for power hand tools include the reciprocating saw ​often referred to as a Sawzall, as well as the Nail Kicker. The reciprocating saw is used to cut the nails at the joint where they hold wood components together. The Nail Kicker is somewhat like a pneumatic nailing tool, except that rather than driving a nail into wood, it is designed to drive nails out of wood, or at least to push them deeply enough to easily free deck boards from the pallet. Machines that disassemble pallets are workhorses for successful high-volume pallet recycling operations. There are two main categories of commercial dismantling machinery. These include the pressure type, often using circular cutting heads, as well as the popular bandsaw dismantler. Pressure-type dismantlers first emerged in the 1970s. Typically this approach involves free turning discs, with an adjustable tabletop. The pallet is fed through the discs, which shear off the fasteners at the point where the deck boards meet the pallet stringer. The speed of the operation is determined in part by the number of heads. When there are three cutting heads present, only top and bottom passes of the pallet are required to achieve disassembly. One of the criticisms of this style of equipment is that while it can be very fast, as much as 30 percent of pallet components damaged during disassembly. Additionally, nail stubs must also be removed or flattened. Bandsaw dismantlers have become the pallet industry's workhorse for the dismantling of pallets. 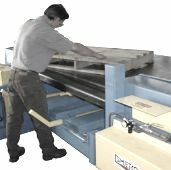 They utilize a bandsaw blade that runs at a height above the table that will allow it to cut through the bottom boards where they meet the stringer. Recyclers appreciate the superior lumber recovery, as well as the clean cut that does not leave nail stubs. Either type of unit may be enhanced by additional equipment such as conveyors to allow a flow of disassembled parts from the unit for sorting and stacking, or further processing, such as to a chop saw to trim pieces to a shorter length. An emerging approach to pallet sorting, disassembly and repair is the use of robots. As the labor market becomes tighter, more costly investments in automation are being justified. CHEP, for example, announced in recent years that it was making a $240 million investment in automation for its service centers, including robots. Alliance Automation, a robotics provider, uses a robot to feed pallets into a bandsaw dismantler, thus removing the human element.